This unit is the insides of any Fox Labs keychain pepper spray product. This 11 gram unit is ideal for carrying in a shirt pocket, boot, vehicle or for hand held concealment for close-in encounters. Filled with 1/2 oz. 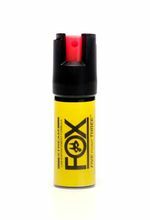 of Fox Labs 5.3MM SHU Pepper spray. Contains the same super-effective formula preferred by law enforcement professionals. 8-10 half-second sprays, range is 8-10 feet in a pencil stream spray pattern. Invisible UV dye for suspect identification. Want a jogger pepper spray with the power of Fox Labs? No problem, add a jogger strap from the dropdown menu..